I recently had the opportunity to attend the RMS EBSD meeting, which was held at the National Physics Lab outside of London. It was a very enjoyable meeting, with lotsof nice EBSD developments. While I was there, I was able to take in a bit of London as well. One of the places I visited was the Shakespeare’s Globe Theater. While I didn’t get a chance to see a show here (I saw School of Rock instead), it did get me thinking about one of the Bard’s more famous lines, “What’s in a name? That which we call a rose by any other word would smell as sweet” from Romeo and Juliet. I bring this up because as EBSD Product Manager for EDAX, one of my responsibilities is to help name new products. Now my academic background is in Materials Science and Engineering, so understanding how to best name a product has been an interesting adventure. The earliest product we had was the OIM™ system, which stood for Orientation Imaging Microscopy. The name came from a paper introducing EBSD mapping as a technique. At the time, we were TSL, which stood for TexSem Laboratories, which was short for Texture in an SEM. Obviously, we were into acronyms. We used a SIT (Silicon Intensified Target) camera to capture the EBSD patterns. 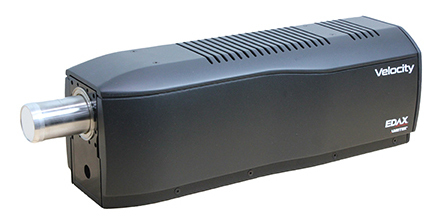 We did the background processing with a DSP-2000 (Digital Signal Processor). We controlled the SEM beam with an MSC box (Microscope System Control). For our next generator of products, we branched out a bit. 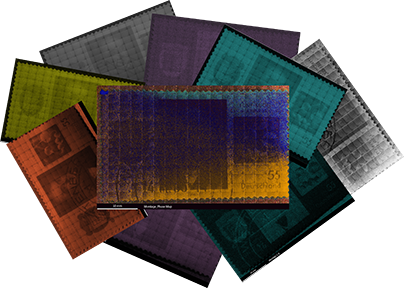 Our first digital Charge-Coupled Device (CCD) camera was called the DigiView, as it was our first digital camera for capturing EBSD patterns instead of analog signals. Our first high-speed CCD camera was called Hikari. This one may not be as obvious, but it was named after the high-speed train in Japan, as Suzuki-san (our Japanese colleague) played a significant role in the development of this camera. Occasionally, we could find the best of both worlds. Our phase ID product was called Delphi. In Greek mythology, Delphi was the oracle who was consulted for important decisions (could you describe phase ID any better than that?). It also stood for Diffracted Electrons for Phase Identification. 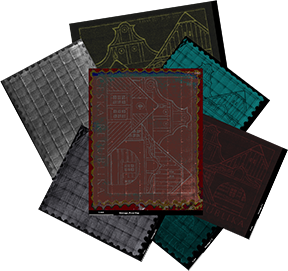 Among our more recent products, PRIAS™ stands for Pattern Region of Interest Analysis System. Additionally, though, it is meant to invoke the hybrid use of the detector as both an EBSD detector and an imaging system. TEAM™ stands for Texture and Elemental Analysis System, which allowed us to bridge together EDS and EBSD analysis in the same product. NPAR™ stands for Neighbor Pattern Averaging and Reindexing, but I like this one as it sounds like I named it because of my golf game. I believe these names have followed in the tradition of things like lasers (light amplification by stimulated emission of radiation), scuba (self-contained underwater breathing apparatus), and CAPTCHA (Completely Automated Public Turing test to tell Computers and Humans Apart). It generates a feeling of being part of the club, knowing what these names mean. The feedback I get though, is that our product names should tell us what the product does. I don’t buy into this 100%, as my Honda Pilot isn’t a self-driving car, but it is the first recommendation on how to name a product (https://aytm.com/blog/how-to-name-a-product-10-tips-for-product-naming-success/). Following this logic, our latest and world’s fastest EBSD camera is the Velocity™. It sounds fast, and it is. Of course, even when using this strategy, there can be some confusion. Is it tEBSD (Transmission EBSD) or TKD (Transmission Kikuchi Diffraction)? Does HR-EBSD give us better spatial resolution? Hopefully as we continue to name new products, we can make our answer clear. Display of postcards from my travels. …L. A. – this is the title of a popular song from Joshua Kadison which one may like or dislike but at least three words in this title describe a significant part of my work at EDAX. Truth be told I’ve never been to Los Angeles, but as an application specialist traveling in general is a big part of my job. I´m usually on the move all over Europe meeting customers for trainings or attending exhibitions and workshops. This part of my job gives me the opportunity to meet with lots of people from different places and have fruitful discussions at the same time. If I am lucky, there is sometimes even some time left for sightseeing. The drawback of the frequent traveling is being separated from family and friends during these times. Nowadays it is easy to stay in touch thanks to social media. You send a quick text message or make phone calls, but these are short-term. 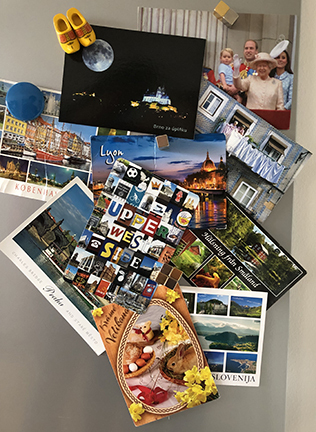 And here we get back to the title of this post and Joshua Kadison´s pop song, because quite some time ago I started the tradition of sending picture postcards from the places I travel to. And yes, I am talking about the real ones made from cardboard, documenting the different cities and countries I get to visit. Additionally, these cards are sweet notes highly appreciated by the addressee and are often pinned to a wall in our apartment for a period of time. Within the last couple of years, I notice that it is getting harder to find postcards, this is especially true in the United States. Sometimes keeping on with my tradition feels like an Iron Man challenge. First, I run around to find nice picture postcards, then I have to look for stamps and the last challenge is finding a mailbox. Finally, all these exercises must be done in a limited span of time because the plane is leaving, the customer is waiting, or the shops are closing. But it is still worth it. 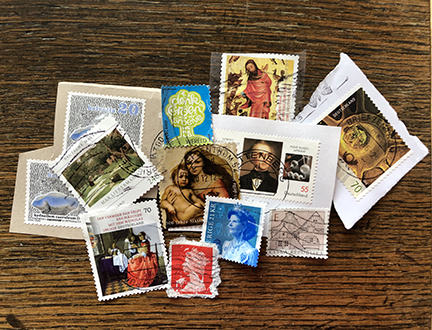 It is not only the picture on the front side, which is interesting, each postcard holds one or more stamps – tiny pieces of artfully designed paper – as well. Postage stamps were first introduced in Great Britain in 1840. The first one showed the profile of Queen Victoria and is called “Penny Black” due to the black background and its value. Thousands of different designs have been created ever since attracting collectors all over the world. Sadly, this tradition might be fading. 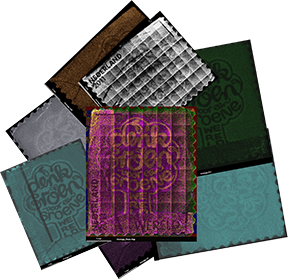 Nowadays the quick and easy way of printed stamps from a machine with only the value on top seems to be becoming the norm. But the small stamps are often beautiful to look at and are full of interesting information, either about historical events, famous persons or remarkable locations. A selection of postage stamps from countries I have visited. For me, as a chemist I was also curious about the components of the stamps. 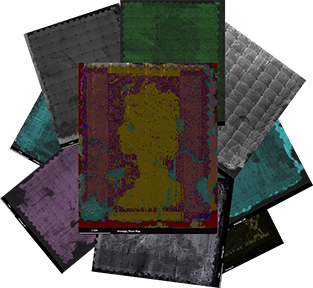 Like a famous painting, investigated by XRF to collect information about the pigments and how the artist used them. For the little pieces of art, the SEM in combination with EDS is predestinated to investigate them in low vacuum mode without damaging them. The stamps I looked at are from my trips to Sweden, Great Britain, the Netherlands and the Czech Republic. In addition, I added one German stamp as a tribute to one of the most important chemists, Justus von Liebig after whom the Justus-Liebig University in Gießen is named, where he was professor (1824 – 1852) and I did my Ph. D. (a few years later). All the measurements shown below were done under the same conditions using an acceleration voltage of 20 kV, with a pressure of 30 Pa and 40x magnification. 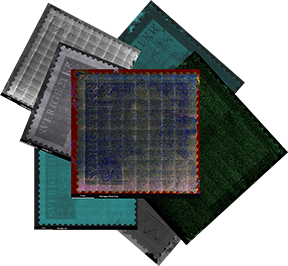 With the multifield map option the entire stamp area was covered, using a single field resolution of 64×48 each and 128 frames. The EDS results show that modern paper is a composite material. The basic cellulose fibers are covered with a layer of calcium carbonate to ensure a good absorption of the different pigments used. This can be illustrated with the help of phase mappings. Even after many kilometers of travelling and all the hands treating the postcards all features of the stamps are still intact and can be detected. The element mappings show that the colors are not only based on organic compounds, but the existence of metal ions indicate a use of inorganic pigments. Typical elements detected were Al, S, Fe, Ti, Mn and others. The majority of the analysis work I do for EDAX and with EDAX customers is very specialized and involves materials, which would not be instantly familiar to non-scientists. It was fun to be able to use the same EDS analysis techniques on recognizable, everyday objects and to come up with some interesting results.